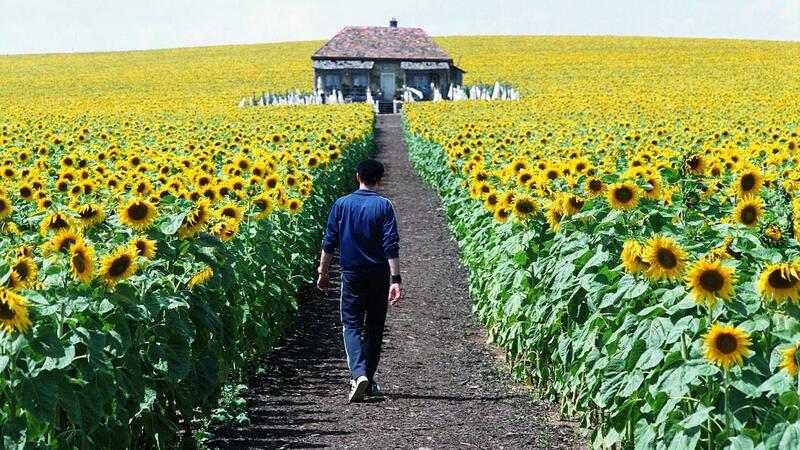 Oh, the man loved his wheatfields. 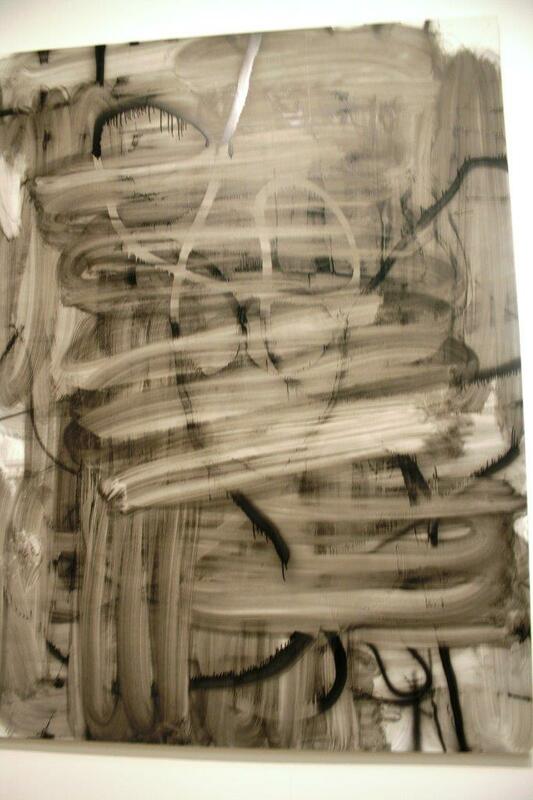 I’m no art critic, but there are two things that jump out at me every time I look at this. One is the cloud formation. I don’t know what sort of day it was when he painted this, but they’re billowing. It’s a swirling mass of cumulus, dancing in some sort of abstract Rorschach formation, enticing you to see what you want to see. To the right, there are the cypresses, tall and dark and imposing like the edges of a sinister forest, the dark against the light. Sadly, there is no sign of a gigantic chicken. But that’s OK.
We’d really only gone to the National to see the Van Gogh. We were, as you might imagine after Friday, rather weary of looking at pictures. Plus it was a Saturday, and the place was crammed full of tourists all crowding round The Hay Wain. Within five minutes, Thomas had had enough. “This is boring,” he said. “It’s just paintings of people and stuff.” Call it an autism reaction: he responds better to the abstract, which enables you to form your own impressions in a way that the concrete does not. I can see his point. Even the Constable is basically a horse pulling a cart across a river, which no one wanted to buy until it was revered by a Frenchman. It made me think about the value of art, and whether things are considered great because great minds think them great. If someone of influence and authority takes a particular shine to something that was previously considered mediocre, isn’t that a fast-track to the sort of validation that it might otherwise have taken decades to earn? Put it this way. If someone like…oh, I don’t know, Philip Pullman was to talk about the merits of ‘Boom Town’, wouldn’t that push it up the polls a bit? Or if Hilary Mantel was to tell you that ‘The Twin Dilemma’ was among her favourite stories, wouldn’t Baker’s cluttered debut merit something of a re-appraisal? If people of literary talent and assumed knowledge (and perhaps this is why I don’t listen to critics, who typically show evidence of one, but not the other) argue in favour of something, perhaps they influence our own views. Perhaps it would explain the enduring appeal of the Mona Lisa, a painting whose reputation I’ve never really understood. There are many theories: the identity of the girl in the picture, the enigmatic smile, the eyebrows (or lack thereof). 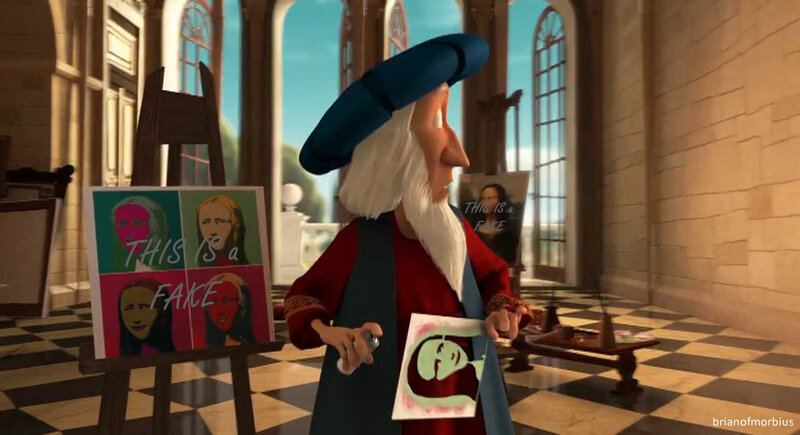 People tell me it’s because Da Vinci was doing things with form that no one had done before, which is venturing into an area of art criticism I don’t really want to visit, largely because I’ll be out of my depth. Perhaps they’re right, but I’ve never been convinced. It’s a pretty painting, for sure, and I’ve not seen it in the flesh (oil. Whatever) but I wonder how much of its immortality may be ascribed to people telling you it’s great. Art is subjective but it is generally agreed that the Mona Lisa is wonderful. Citizen Kane is similarly bold and innovative, and enormously influential, but also rather dull – nonetheless, if you tell people it’s the greatest film ever made with sufficient regularity they will, eventually, start to believe it. 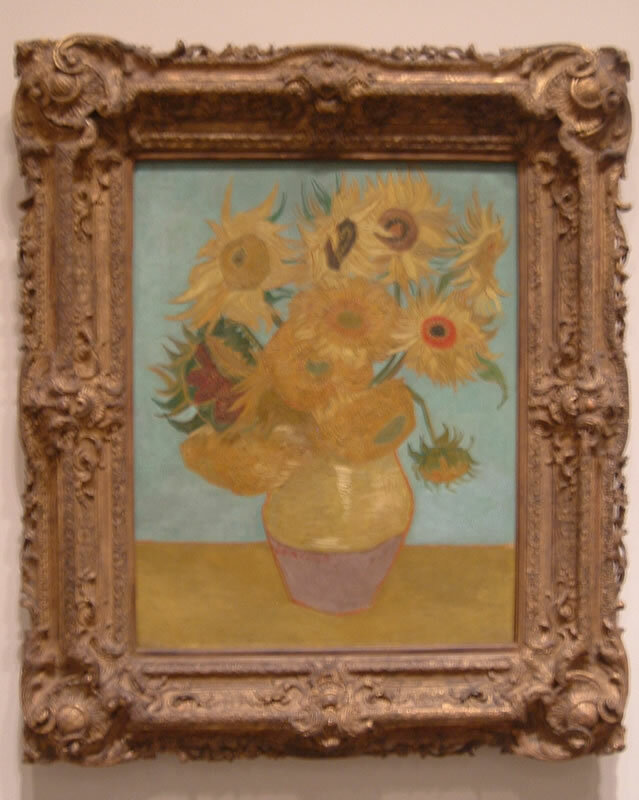 The main entrance to the impressionists’ wing was closed, so we had to hunt for The Sunflowers. 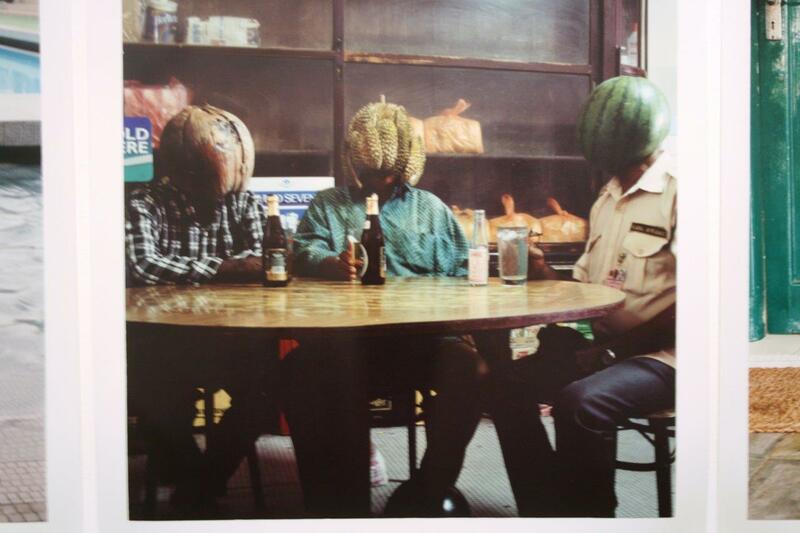 They sit on a wall facing north-west, this unassuming bunch of dried-up flora, a still half-life, “somewhere between living and dying; half-human as they turn to the sun”. There’s a reverence to them, something bold and tortured that jumps out as you stare at the thing, a sense of awe somewhat undermined by the people with iPhones. But I took one anyway, just to say that I’d done it. I went to Philadelphia a few years back; did I ever tell you that? The art gallery there – arguably more famous for the ascending staircase that leads up to its entrance than anything inside – houses several Gilbert & George works, a couple of Warhols – oh, and this. This is the repetition of the third version (the original third hangs in Munich), while the one at the National is the (original) fourth. (In Whovian terms, that’s presumably Katy Manning impersonating Jon Pertwee.) It looks rather unassuming on screen, the oils crystallised as pixels, a tribesman missing his soul. Seeing things like this up close is unique because you can get close enough to see the brushwork, the hours of labour, the years of psychosis. 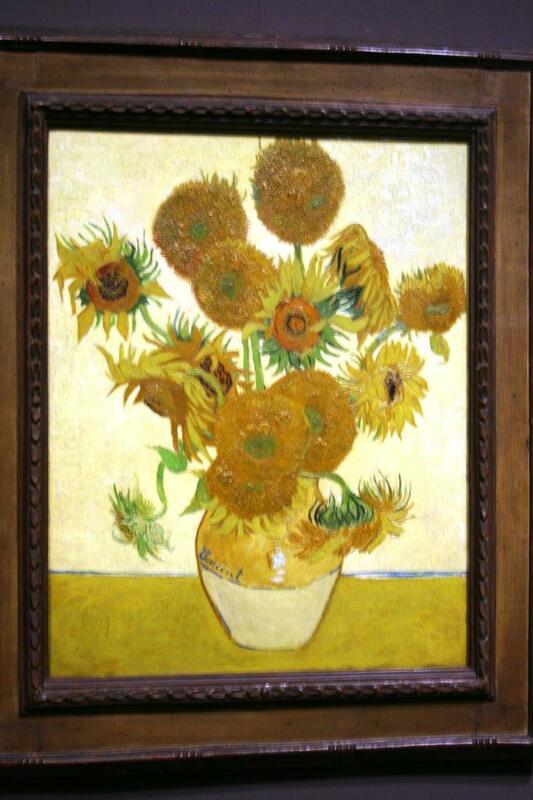 And yet I wonder how much of my love of Van Gogh and his childish scribbling is thanks to Doctor Who. Is it possible to appreciate the birth of impressionism for what it is and simultaneously be indifferent to the Lisa del Giocondo? Perhaps it isn’t. It’s times like this I wish I really understood art, so I could at least make you think I knew what I was talking about. Oh, and it was all going so well. By the time we finished at the National Gallery everyone was about ready to come home. We’d spent the morning at the Science Museum, which houses more than you can reasonably examine in a single day, so we concentrated on the home life exhibition in the basement (Betamax! Pong! SPEAK AND SPELL!) before trooping up to the aviation centre. It was humbling, somehow, being surrounded by all those ancient engines and prototypes, strolling across the shoulders of giants. Amelia Johnson was in residence; she’s looking pretty sprightly for a woman of 112. The second floor houses technology (antique mobiles! An original copy of Windows! A DRAGON 32!). There was an exhibit about the history of TV. Daniel was watching the coronation. So naturally I did this. I asked Daniel for his favourite part of the trip, which turned out to be a tie between the youth hostel we visited and the Tower of London, which we’d skirted the day before. It sits on the north bank of the Thames, not far from Fenchurch Street, brown and somehow unassuming. It’s not even much of a tower, really, at least not in the sense that Barad Dur is a tower, or Orthanc is a tower, or Stark Tower is – well, you get the idea. It’s more a fortress, which I suppose is the point. “So why did you swear?” said Josh, as we strolled around the square outside. I was thinking about this as we wandered around, slightly frustrated that I seem to be the only one who remembered it. It’s an excuse to watch DOTD again, I suppose, not that I need one. It remains a high point, infused as it is with an invigorating sense of wonder, understated (but carefully crafted) narrative and the best use of eyebrows in the history of the show. It was an episode that made me appreciate Doctor Who all the more, at the end of a year of borderline overkill (let’s not discuss the after-show party, please) and given my current sense of weariness about the whole thing, it’s one I often go back to. Perhaps that’s what it’s all about: surrounded by people who watch the show but don’t necessarily understand it, who just want to take photos and run…perhaps I’m a residential bird, tired and sluggish and in need of new batteries. At the time, I was hurt. Retrospectively he was quite correct, and I wonder what Jay would say if he could see the rubbish title I’ve given this post. Oh, it fits, of course – but aren’t you, he’d say, in that Estuary English voice he has, in danger of devolving into that pretentious idiot you once were? To which I’d shrug and say “Perhaps he never really left”. Anyway, artistic pretension is kind of the topic. And we’ll start here. 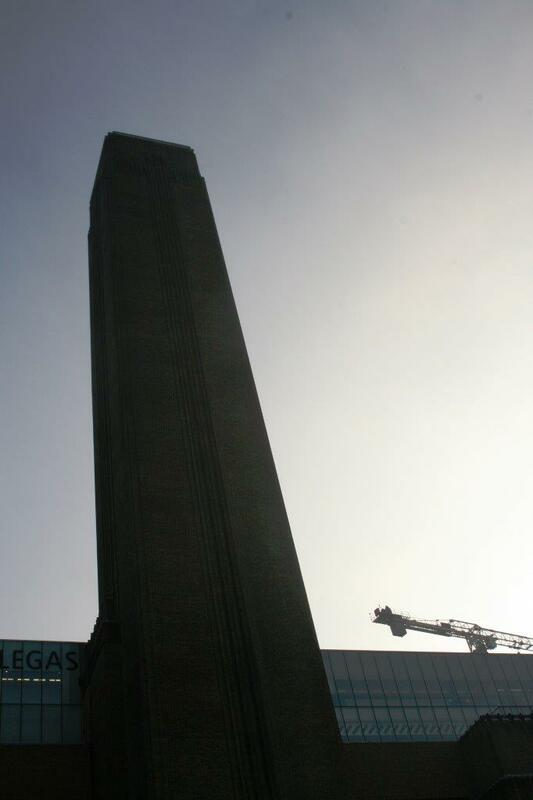 What was I doing at the Tate Modern? We were on a Cultural Visit. I’d pulled the boys out of school (all pre-approved, of course) and we went on one of Emily’s Grand Excursions, all timetabled and planned to the last detail so as to avoid long periods of inactivity and waiting around – not because either of us are impatient but because the boys get restless when they have to queue. It’s the way of things for us, and something I’ve learned to tolerate. It was the reason we didn’t go to the Natural History Museum and the start of the chain of events that led to me threatening to delete Thomas’s Xbox profile. But I’m getting ahead of myself. Let’s get back to the converted power station. Visiting the place was an experience – a good one, by and large, but the sort of thing that has you scratching your head. 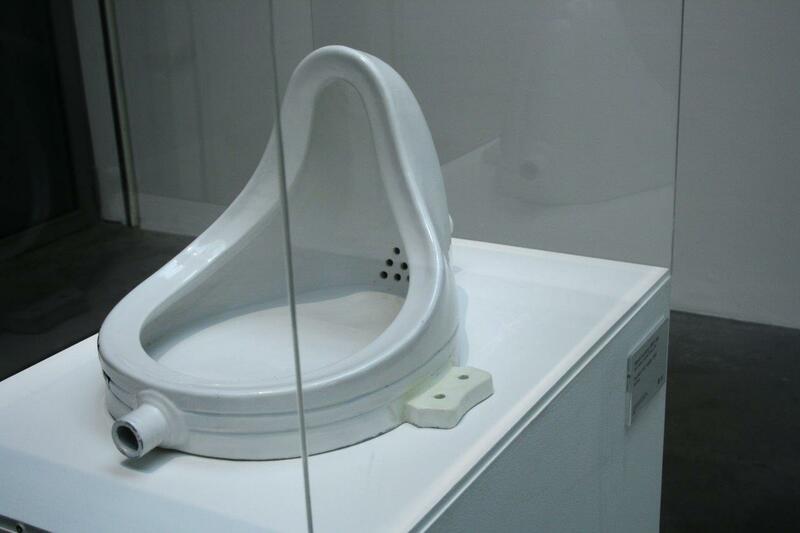 I’ve decided, in the first instance, that I will never understand Marcel Duchamp. I mean, it’s a bloody toilet. I don’t care that removing it from its intended setting and labelling it ‘art’ gets it a glass case. If I was to nail a door handle to a piece of chip board and call it art, would you give me a wing to myself? I don’t bloody think so. What’s that? A snow shovel? Oh, very well. Just let me deal with the burglars first. One floor down, and we found a room full of enormous Polaroids where people’s heads had been exchanged with different fruits. It’s supposed to be a statement on rejoining with nature. It looked like something I do in Fireworks for the sake of a cheap pun. This person had a gallery to themselves. A gallery! 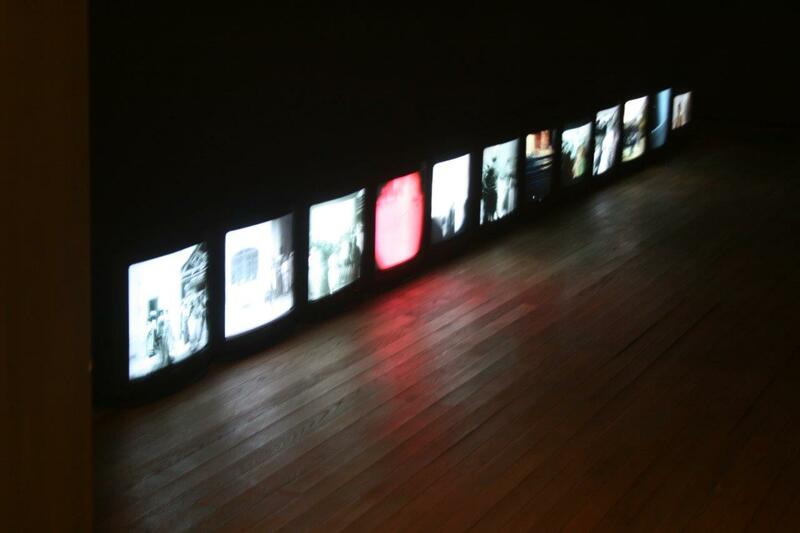 In another room, we found twelve TV sets, each displaying a different piece of looped footage; the installation was entitled Workers Leaving the Factory in 11 Decades, and included scenes from Workers Leaving the Lumière Factory in Lyon (thought to be the first film ever made) through to Dancer in the Dark, a film I’d hoped never to see again. Bjork’s lovely, but I still don’t understand how David Morse ever got his equity card. On the other hand, there were some wonderful pieces. They have Warhol, which Thomas (who developed something of an interest after a school topic) refused to believe was genuine. They have a large, primal-coloured Lichtenstein taking up most of a wall. They have a magnificent stack of radios, floor to ceiling, designed to emulate information overload. And in a darkened screening room they were running loops of Hito Steyerl’s How Not To Be Seen, which was simultaneously bizarre and, I think, one of the most beautiful things I’ve ever experienced. Oh, and they have this. It is thirty feet high and it reminds me of the last time I had to clean the bathroom wall. What does all this have to do with Doctor Who? 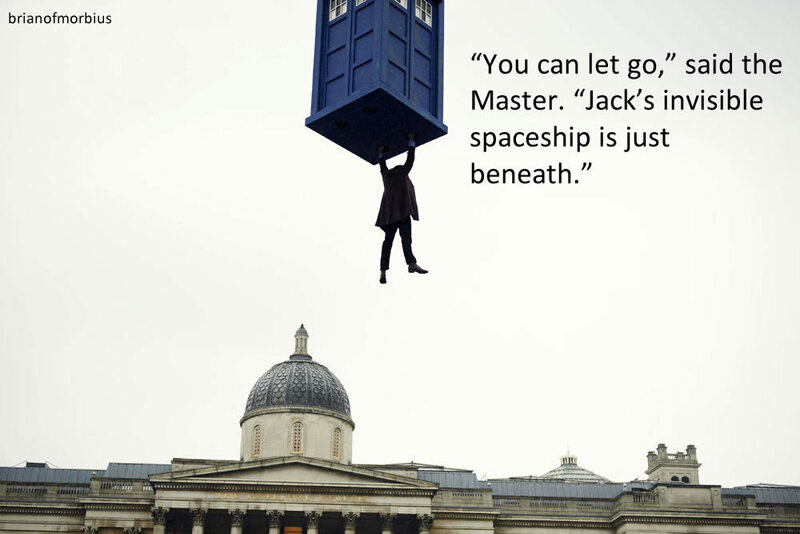 Well we’ll get to that another day, when I’ve processed the myriad ideas I have in my head about how to reconcile Doctor Who and modern art. In the meantime, we should be grateful that the TV show was never quite so pretentious.